It’s one thing to read about another country, its history and its culture. It’s another to walk where Vikings landed, visit castles and cathedrals that are in books and gather in spots where the locals share their stories. 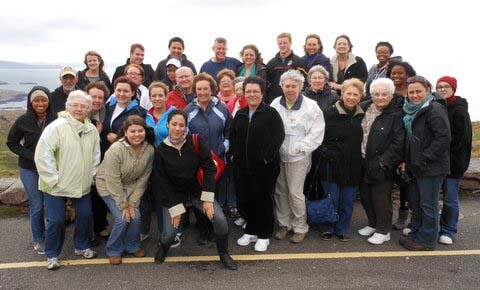 Tidewater Community College’s eight-day trip to Ireland offered through the college’s Study Abroad program provided that glorious learning opportunity in mid-May for 32 students, faculty and friends. English and Humanities Professor Doris Jellig planned the trip to a country she has become passionate about, visiting there 10 times with TCC students and four times on her own. Every trip to Ireland has similarities, but Jellig ensures each one is also distinct as often she has repeat travelers in the group. Time in Dublin is a must, she says, considering it is the capital city and the historical and cultural center for the country. A hop on, hop off bus that runs 24 hours allowed the group to choose among a myriad of activities. TCC social science major Charlotte Zach enjoyed a visit to Dublin Castle, the former British seat of power, and a tour of the Guinness Factory, the top visitor attraction in Ireland. It’s an experience that starts by standing at the bottom of the world’s largest pint glass, which rises through the center of the seven-story building. One hundred miles south in Waterford, she loved watching molten glass take the form of elegant pieces of crystal at the House of Waterford Crystal. Like prior groups, this one was thrilled with a tour bus driver named John, whose wealth of knowledge and impromptu stops added to the wonder of the trip. One such stop involved watching border collies herd sheep on a mountainside. For the first time, Jellig planned a stop at Castle Durrow, the first country house of importance built in the 18th century that has since become a haven for walkers, golfers, tourists and wedding parties. “We had our first breakfast there and toured the homes and gardens afterward,” Jellig says. Jellig stayed a few extra days to explore future tourist spots for the next TCC group to study abroad. For information about International Programs, visit the Office of International Programs in the Kempsville Building, D126A on the Virginia Beach Campus or call 757-822-7296. A limited number of scholarships are available for study abroad programs.